Burial grounds are one of the Parish Council's statutory responsibilities. The Parish Council maintains three burial grounds in the village. This is the historic burial ground around St Mary's Church, and has long been closed to new interments. However the Parish Council has assumed responsibility for its maintenance. The newer burial ground next to the old churchyard is maintained by the Parish Council. It is now full and closed to further interments, except in previously reserved spaces. However there is a Garden of Remembrance where ashes may still be buried after cremation. Arrangements may be made directly with the Parish Council (see below for contact details), or through a funeral director. All interments (burials) are now made in the Council's cemetery on Bicester Road. Bicester Road is a lawn cemetery: with very limited exceptions, apart from the headstones and their bases graves are covered with turf, in order to give the site a pleasant rural appearance. Arrangements for interments are made through funeral directors. 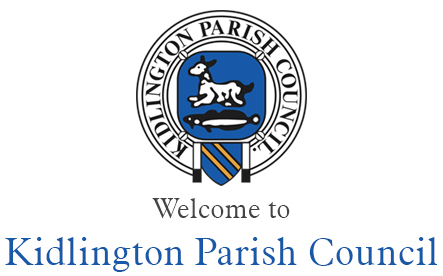 All other communications about the cemetery should be directed to community@kidlington-pc.gov.uk, or to the address given under the Contact page.